iWorx offers the Opsens Fiber Optic pressure catheters in sizes starting at 1.0F. These catheters are recommended for measuring pressure in small vessels as well as ventricular pressures in small rodents. They are also highly recommended for recording arterial and chamber pressures in large animals. Since they are fiberoptic, they are suited for MRI applications. Fiber Optic catheters offer superior sensitivity and temporal resolution compared to fluid-filled catheters and are generally more suitable for measuring intra-cardiac pressures from animal species with high intrinsic heart rates. Systems include catheters, an amplifier/signal conditioner, data recorder and software. iWorx offers catheter-tipped solid-state pressure catheters in sizes ranging from 1.2F to 7F. These catheters are recommended for measuring pressure in small vessels as well as ventricular pressures in small rodents. They are also highly recommended for recording arterial and chamber pressures in large animals. Solid-state transducer-tipped catheters offer superior sensitivity and temporal resolution compared to fluid-filled catheters and are generally more suitable for measuring intra-cardiac pressures from animal species with high intrinsic heart rates. Systems include catheters, an amplifier/signal conditioner, data recorder and software. Invasive measures of pressure are not always possible and, as a result, there may be a need for non-invasive methods to detect pressure. The most widely accepted technique for animals is the tail-cuff method. 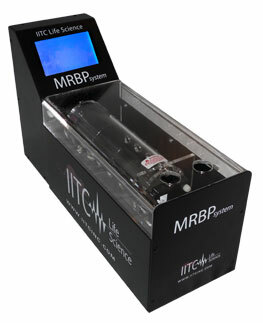 iWorx offers the new IITC Non-Invasive Blood Pressure Systems for mice and rats. The IITC Life Science tail cuff system is a compact, integrated single unit which includes a warming chamber, restrainer and tail cuff. The system is controlled by a built in touch screen interface with controls for temperature, test cycle, cuff inflation, cuff calibration and various test parameters. Up to 200 systems can be daisy chained to record independently or simultaneously. Data can be downloaded directly onto a USB thumb drive while also being acquired via analog output by LabScribe software for further analysis. Various sizes of restrainers and tail cuffs are available to suit a variety of research models. iWorx offers several solutions for measuring pressure including fluid‐filled pressure transducers, catheter-tipped micro pressure sensors and non‐invasive tail cuff pressure systems. LabScribe software with the Blood Pressure Module provides built‐in software routines to perform a number of arterial and ventricular pressure calculations. LS-30TXT The iWorx ASCII Import Module enables import of data in text format that was recorded in any other data acquisition program. The module also allows the researcher to use the analysis functions in LabScribe software on data they may previously recorded with another a different program. iWorx Blood Pressure Measurement Systems are configured from a wide range of high performance components, optimized for each applications. Components include transducers, catheters, non-invasive devices, amplifiers, recorders, cables, and software. Click on the links below for more information on each component. With integral 3cc flush device and stopcock, can be used to measure direct arterial or venous pressure in animals. iWorx Recorders can record data from various catheters made by Scisense and Millar. Please contact an iWorx Applications Specialist for details. MRBP Mouse and Rat Tail Cuff Method Blood Pressure SystemsCompact NIBP system for rodents with built-in amplifier and warming chamber. Touchscreen controls all parameters for system. Allows non-invasive testing of a single animal at a time. Sensors come in a variety of sizes ranging from 1/4″ to 1″. Restrainers come in a variety of sizes to suit a wide range of animals. Dedicated bridge amplifier for iWorx-brand transducers that provides four channels of excitation power, gain, and noise filtration. High performance, general-purpose research amplifier with high input impedance and high CMR to allow reliable low noise recording of biopotential signals, as well as outputs from strain gauge type transducers, such as force, displacement and pressure. Includes an isolated head stage for recording ECG, EMG and EEG signals from humans. The iWorx RA Recorder is the foundation for iWorx advanced research systems. Whether your work involves assessing cardiac performance, analyzing oxygen consumption and carbon dioxide production for exercise physiology, or measuring some other physiological parameter, iWorx RA provides the ease of use and flexibility to speed your research. The iWorx 404 Recorder is an economical, high performance four channel data recorders for use with a broad range of analog amplifiers. The recorder offers 16-bit resolution at a maximum data collection speed of 10 kHz, making it appropriate for most research applications.